Each July, a particular toy company from Everett, Washington likes to head south during the summer for a certain event called San Diego Comic-Con. The company’s goal is to showcase their upcoming products for the whole world to see, and to meet their loving fans. The company I am talking about is Funko, which was founded in 1998. Funko’s presence at San Diego Comic-Con goes beyond having a booth, Funko likes to put on a show with an off-site called Funko Fundays. Fundays is an event where fans (who are fortunate enough to get tickets) can celebrate all things Funko with the opportunity to play games, as well as getting free food, drinks, entertainment, and a wealth of free gifts with which the company loves to bombard its fans. Basically, Funko is like John Hammond from Jurassic Park, sparing no expense in making sure that their fans are having ‘fun’, a motto they hold dearly. 2017’s Fundays did not see a dip in the fun arena, thanks to the countless showering of entertainment Funko gave its fans that year. I had a great time once again, but what about 2018? Did the fun trend continue? Luckily, it did, but not without an issue, which I will get to in a moment. 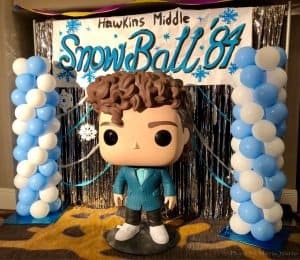 What was great for 2018 was this year’s 1980s Stranger Things/high school prom theme. It was fun dressing up in ‘80s gear and reliving certain trends that I remembered enjoying as a kid. To maximize the ‘80s theme, Funko had the four audience groups designated as teams Goonies, Ghostbusters, The Breakfast Club and Gremlins. Yours truly was with team Gremlins! Like the mogwai, I was hungry. Yet before getting any food, Funatics (a nickname for Funko’s fan base) like myself were able to pick up a free Freddy three-pack Pop! box (also known as the Box of Fun), Funko t-shirt and fans. Later the same three-pack Pop! box was available online on the Funko Shop website. The mystery boxes were designed to look like a high school locker from Stranger Things, yet Funatics at Fundays also got another goodie box that was shaped like a small boom box. Funatics could also compete in a corn-eating contest called the “Can-o-Corn Challenge.” I did not take part of this contest as I wanted my stomach to be ready for the actual food, and to avoid any stomach issues as well. Those that did take part of the challenge did have a good time scarfing down so much corn. Yet this challenge was the only game outside of the main ballroom. The previous years had multiple games to try out, so I am curious as to why there was only one outside contest at this year’s Fundays. I’m sure that a few fans were bummed to see that only one game was present. 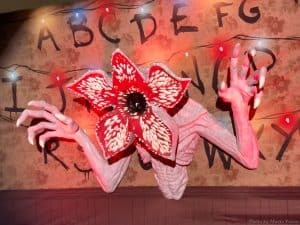 At least there were two amazing Stranger Things-themed photos areas though. I believe that 2017 only had one designated photo area, like in 2016, so it was nice to see another spot for fans to try out. A good amount of Funatics were having fun with these attractions. What I did find strange (no pun intended) was that the ballroom wasn’t open yet for the attendees to enter, but the food was ready to be eaten! So, like everyone else was doing, we all ate our dinners standing in the lobby. If you wanted to be next to your friends during that time, you had to search for them through a sea of hungry people, instead at the table you were assigned. Overall, I found this part of Fundays to be very awkward/disorganized and wondered why no one could enter the main ballroom at all. To be fair, my best guess is that it wasn’t ready for business, but it would have been nice to eat our dinners at the designated tables, more comfortably. This was the only issue that Fundays 2018 had, in my opinion. Once everyone was inside the ballroom, the show itself didn’t start until 8:30pm PST. 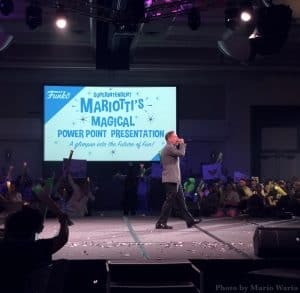 To get the crowd hyped up, each side of the room had giant projector screens playing old 1980s commercials and introductions, as well as a few music videos that I really dug watching. Fans also had the chance make their own signs by using a big piece of white paper at each table, with multiple colored markers on hand, thanks to Funko. I saw some good signs throughout the night, especially in the section I was in. Right in the middle of the room was the main stage, which was the spot to see great performances done by the amazing Cirque du Soleil’s “O” members, as well as two quick-changing magicians who dazzled the audience with their amazing tricks. 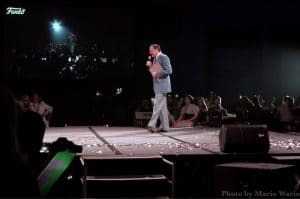 The stage was also the spot to see high-profile guests pop up for certain team contests, and to see Brian Mariotti (the CEO of Funko) and Mike Becker (the founder of Funko) as well. Becker dressed up as a ‘80s high school vice principal, which was pretty hilarious to see. As with every Fundays, new products were announced and the fans loved what they saw, yet it didn’t seem like (to me) that the crowd was all that excited with the Fortnite Pop!. I, however, was happy to see that gaming series getting some love from Funko, plus it just makes economic sense to tackle Fortnite, due to how popular it is right now in the gaming community. My bet is that most Funatics like myself were hoping for a surprise announcement such as Funko and Nintendo teaming up for some more business, which did not happen. Although Mr. Mariotti did say to the crowd that they should email Nintendo to let them know that Funko wants to make new Pop!s for them. He wants his company to have a chance to make a Mario Pop!, like they did with Pikachu. By far, my favorite part of the whole event was when Walter Jones (who played Zack, aka the Black Ranger from Mighty Morphin Power Rangers) appeared on stage with the Power Ranger theme song blasting loudly in the background. Since the early ‘90s, I have been a fan of this TV series, so I was in heaven during this ‘mighty morphin’ moment. Everyone was singing along with Jones, which got the room buzzing. Oh, and he picked team Gremlins to represent! How great is that? Other celebrity guests selected the teams they liked. Ming Chen (Comic Book Men) picked the Breakfast Club, which went on to win on being the loudest group for the first team challenge. After every contest, each team won a special Freddy Pop!, yet Yoda Freddy was the best one due to how unique it was, in my opinion. Luckily, team Gremlins won the last contest, which was who could head bang the best with blonde wigs while using fake electric guitars, too. The two gentlemen for team Gremlins rocked on the best, so thanks to them, each table in that section got an alien Freddy Pop!. I will say that whoever cosplayed as Teen Wolf for team Ghostbusters, my gosh, was it good! As you can expect, that person won the ‘best outfit challenge’ for his team. Yet all table 20’s got the best gift of them all that night. 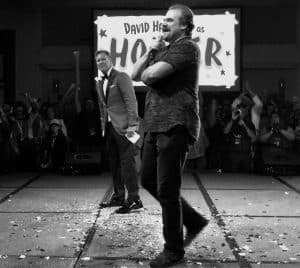 They received a very limited gold painted Stranger Things Sheriff Hopper Pop!, with David Harbour appearing on stage to announce the gift. To those who are wondering as to why those tables only got that item…Funko is celebrating its 20th anniversary this year, so every table 20 was the lucky spot to be. I do wonder if this theme will continue next year, because Funko will be turning 21. But the other sections weren’t forgotten, as everyone got a Stranger Things Steve and Robin Pop! that you could only get at Fundays 2018. The gifts were presented after actress Maya Hawke (who plays Robin in season 3 of Stranger Things) came out on stage to surprise the crowd. Once the event itself was done and the final gift was handed out, it was time to say goodnight. A collection of old fan photos were shown on each projector screen. Overall, the party itself never got dull or boring at any moment during the night. The electricity inside the room was amazing to see, and I hope the livestream was able to capture that effectively and I am also curious if the stream was laggy at all, since the wireless reception was terrible inside the room. I couldn’t get any signal at all to make any call or to check the news before the party got going. As for everyone else around me, my friends and one family member all had a great time being at the event. In reality, Funko has always done a fantastic job in putting on a show, and this year was no different. Hopefully the early ballroom access situation improves next year, which I’m sure it will. When comparing this year’s event to the last two Fundays I’ve attended, minus the dinner issue, 2018 was pretty good and, yes, super fun as well! Again, 2016 will always be my number one, but this year was spectacular in its own right. I loved it! Hopefully, I will be lucky enough to attend another Fundays next year, as I love hanging out with my best friends, as well as seeing/experiencing what the Funko world has in store for us all. 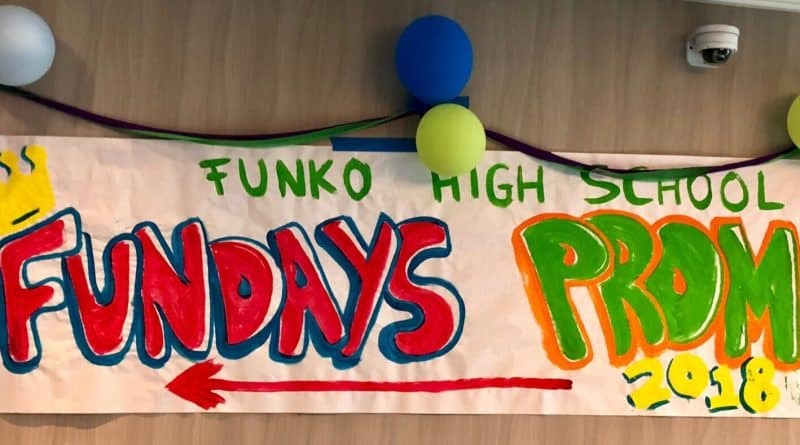 Did you attend this year’s Funko Fundays? Did you watch the stream again on Funko.com? If so, please share your thoughts by going to the FoCC Forums. See you there!